Facing Autism in New Brunswick: AutismPro - "Somewhat" Evidence Based Internet Autism Intervention or Not Evidence Based At All? AutismPro - "Somewhat" Evidence Based Internet Autism Intervention or Not Evidence Based At All? data collection will substantiate the child’s progress in the event of due process. Beware the magic bullet solution. Beware the cheap and easy fix. Whenever a crisis arises anywhere there always seems to be someone willing to sell a magic solution to the problem. Autism disorder diagnoses are soaring, the costs of treating these serious neurological disorders are soaring, the costs of not treating autism disorders, in terms of increased state funded adult autism care are also soaring. A solution must be found so what is the solution? For years parents and professionals have been urging government and educational service providers to implement evidence based approaches to treating and educating autistic children. The ASD's are serious neurological disorders that require a serious evidence based approach. And time is important in the developmental life span of children to ensure the maximum results. "While ineffective therapies may be harmless, they waste parents’ money and the child’s valuable therapy time. Furthermore, the delay in implementing effective treatment may compromise the child’s outcome." In New Brunswick the Inter Departmental Committee on Autism Services met for 18 months before concluding that there were precious few autism specific services in New Brunswick. One of the strengths of the IDC Report finally issued in November 2001 though was an emphasis on provision of evidence based interventions for autistic children. Now, however, the New Brunswick Department of Education, without consulting the Autism Society New Brunswick, is engaged in what it describes as a pilot project involving AutismPro, a non-evidence based autism intervention tool created in part in New Brunswick and advocated for strenuously by senior levels of the New Brunswick Department of Education. The establishment of this pilot project, especially when established in secrecy by Department officials, represents a significant departure from the commitment to evidence based interventions made in the 2001 IDC Report. In fact the entire world is being tempted to abandon the evidence based approach to autism disorder interventions and instead is being sold a much different approach - the "somewhat" evidence based approach of AutismPro, a commercial, untested, unstudied, unverified, product sold by Virtual Experts Clinic Inc. Unfortunately civil servants looking for cheap solutions, especially senior education bureaucrats looking to maintain control over their department costs and agendas, are eager to adopt this product which is advertised as based on "evidence based interventions" a somewhat questionable claim. VEC Inc., the owner of AutismPro, is a master of SelfPromotion. VEC Inc's self congratulatory PR releases on the business newswire services ensure that the world is led to believe that AutismPro is a can't miss product, the magic bullet solution to the world's growing autism crisis. What none of the AutismPro SelfPromotion information does is indicate how the product in any way meets an evidence based standard as an effective autism intervention. Quite the contrary, the VEC Inc's own public statements suggest that AutismPro is NOT an evidence based effective autism intervention; or at best might be properly described as "somewhat" evidence based. These groupings of methods are simply categories of intervention types, not actual interventions. Many of the interventions listed under these three categories are not in fact recognized as evidence based effective interventions for autism, at least not in any of the major reviews of autism interventions conducted in the last 10 years. There have been several reviews conducted by US state and federal agencies. In addition, applied behavior analysis’ evaluative procedures are effective not only with behaviorally-based interventions, but also for the systematic evaluation of the efficacy of any intervention intended to affect individual learning and behavior. ABA’s emphasis on functional assessment and positive behavioral support will help meet heightened standards of IDEA ‘97. Its emphasis on measurable goals and reliable data collection will substantiate the child’s progress in the event of due process. 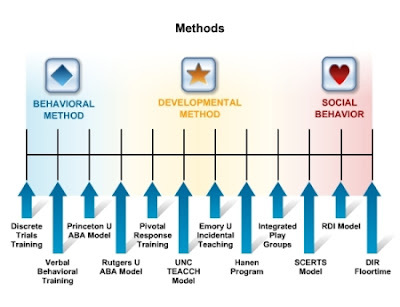 "The effectiveness of ABA-based intervention in ASDs has been well documented through 5 decades of research by using single-subject methodology21,25,27,28 and in controlled studies of comprehensive early intensive behavioral intervention programs in university and community settings.29–40 Children who receive early intensive behavioral treatment have been shown to make substantial, sustained gains in IQ, language, academic performance, and adaptive behavior as well as some measures of social behavior, and their outcomes have been significantly better than those of children in control groups.31–40. Several reports have documented progress in children who have received TEACCH services as well as parent satisfaction and improvement in parent teaching skills, but these reports were not from controlled studies of treatment outcomes.44–49 In a controlled trial, Ozonoff and Cathcart50 found that children treated with a TEACCH-based home program for 4 months in addition to their local day treatment programs improved significantly more than children in the control group who received local day treatment services only. AutismPro does not actually appear to offer a specific evidence based intervention. Although it references ABA (usually as being ABA "based") in some of its press releases and on its web site it does not appear that a straightforward ABA intervention is offered. As VECInc states on its web site in You Asked About AutismPro AutismPro borrows elements from various intervention methods, which methods themselves have stronger or weaker evidence bases in support of their efficacy. By taking elements of these programs and combining them in a new eclectic mix VECInc. is essentially creating a new intervention altogether; one with no evidentiary basis for its efficacy. Does AutismPro incorporate such therapeutic teaching methods as Applied Behavior Analysis and DIR/Floortime? Somewhat. AutismPro integrates the fundamental components behind the continuum of well-researched behavioral, developmental, and social methods for teaching a child with autism and organizes them into clear choices, recommendations and training within the Strategy Plan section of the program. Does AutismPro incorporate such strategies as TEACCH, PECS, and Social Stories? Somewhat. AutismPro integrates the fundamental principles behind dozens of well-researched strategies for adapting the environment or activity for a child with autism, and organizes them into clear choices, recommendations and training within the Support Plan section of the program. How does AutismPro help me choose a method of instruction? AutismPro saves you time and effort by organizing the confusing and intimidating range of commonly accepted educational therapy methods in autism into a series of educated and supported choices. You choose the philosophical approach (behavioral, social and developmental) with which you feel most comfortable, and you’re free to make modifications to suit your child’s needs. Does AutismPro introduce new methods for autism therapy? No. The methods in AutismPro are a comprehensive integration of strategies from commonly accepted educational therapy options in autism, delivered on a new platform and organized according to a new cohesive conceptual framework. With AutismPro you get practical descriptions rather than a confusing list of strategy names, allowing you to more easily compare choices and make decisions. Most educational programs available to young children with ASDs are based in their communities, and often, an "eclectic" treatment approach is used, which draws on a combination of methods including applied behavior analytic methods such as DTT; structured teaching procedures; speech-language therapy, with or without picture communication or related augmentative or alternative communication strategies; SI therapy; and typical preschool activities. Three studies that compared intensive ABA programs (25–40 hours/week) to equally intensive eclectic approaches have suggested that ABA programs were significantly more effective.31,32,34 Another study that involved children with ASDs and global developmental delay/mental retardation retrospectively compared a less intensive ABA program (mean: 12 hours) to a comparably intensive eclectic approach and found statistically significant but clinically modest outcomes that favored those in the ABA group.33 Although the groups of children were similar on key dependent measures before treatment began, these studies were limited because of parent-determined rather than random assignment to treatment group. AutismPro is an eclectic autism intervention because it selects principles and elements of various interventions. And those interventions themselves enjoy varying degrees of evidence based supports. As a new eclectic mix it is impossible to say that AutismPro is itself an "evidence based" intervention tool. The use of the internet also raise questions about the extent to which AutismPro can accurately be described as "evidence based". Autism is a neurological disorder which often presents serious environmental issues for autistic children. A specific location, even if identical in all obvious aspects to another location, may be problematic for an autistic child. Slight environmental changes may have dramatic effects on an autistic child not always obvious to someone else. Autism is not a motor vehicle registry or corporate affairs data bank both of which lend themselves readily to two way internet based communication of significant information. Autism is a very "environment sensitive" condition. The further removed in place and time that persons, whether actual advisors, or program writers, are from the specific environment involved, the less likely they will be able to offer reliable solutions to autism challenges. Delivery of autism interventions by internet is something in itself which is radically new. To suggest that an internet based intervention service which is promoted as revolutionary is also evidence based is illogical, inconsistent and inaccurate. Labels: autism disorders, autism interventions, AutismPro, evidence based interventions, Virtual Experts Clinic Inc.